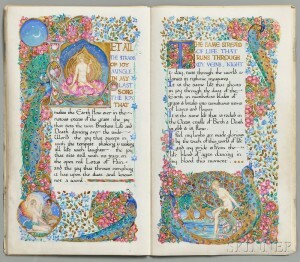 Skinner to Host Fine Books & Manuscripts Online Auction May 18–26 | Skinner Inc. The auction features a well-rounded selection of unique documents and rare printed books, including three documents signed by George Washington (Lots 1107, 1108, & 1109); a large archive of letters and notes by Nantucket whaler Seth Pinkham (Lot 1072, estimated between $10,000 and $15,000); a rare large-format signed photograph of Charles Dickens (Lot 1025, $8,000-$10,000); an early John F. Kennedy letter written just after the death of his brother Joe in 1944 (Lot 1053, $7,000-$9,000); a manuscript leaf from Henry David Thoreau’s Cape Cod (Lot 1099, $6,000-$8,000); two signed photographs of Theodore Roosevelt (Lots 1083 and 1085); and other interesting original material. 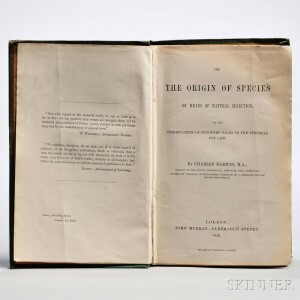 The history of science is represented by first editions of Darwin’s On the Origin of Species (Lot 1144, $60,000-$80,000); Alfred Russel Wallace’s A Narrative of Travels on the Amazon (Lot 1267, $2,000-$3,000) and The Malay Archipelago (Lot 1268, $2,000-$3,000); the first separate edition of Albert Einstein’s Foundation of the Generalized Theory of Relativity in German, 1916 (Lot 1163, $4,000-$6,000); and a first edition of John James Audubon’s octavo Birds of North America (Lot 1127, $30,000-$35,000). Illustrated books are also featured in the auction, along with Audubon and other natural history prints and a very strong section of historic maps. Other highlights include a very early Helen Keller letter (Lot 1051, $3,000-$5,000) and a stunning illuminated manuscript from 1917 by Jessie Bayes (Lot 1131, $15,000-$17,000). Previews for the auction are free and open to the public. Previews will be held in Boston on Wednesday, May 24 from 10AM to 5PM and on Thursday, May 25 from noon to 7PM. Illustrated catalog 2891T is available for download or viewing online at www.skinnerinc.com. Prices realized will be available online at www.skinnerinc.com during and after the sale. The Skinner website also enables users to view all lots in the auction, leave bids, order catalogs and bid live, in real-time through SkinnerLive! This entry was posted in News and tagged Albert Einstein, Alfred Russel Wallace, American documents, american history, audubon, books auction, boston auction, Charles Dickens, George Washington, Helen Keller, Henry David Thoreau, Jessie Bayes, John F. Kennedy, literary history, presidential documents, Rabindranath Tagore, rare books, rare manuscripts, Seth Pinkham Nantucket whaler, Theodore Roosevelt by Skinner. Bookmark the permalink. I have a full 40 volume set of the Naturalist’s Library (William Jardin) with hand colored plates. Very good condition. Is this something that you would include in your auction?